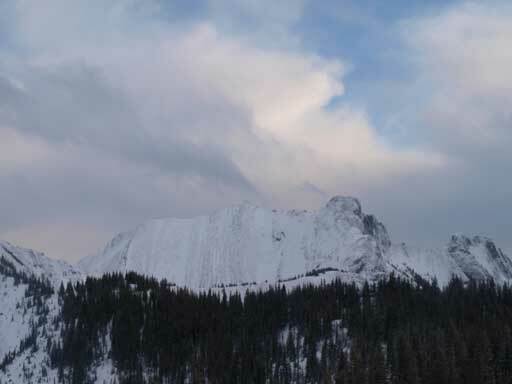 The very unofficially named “Twin Towers” is a difficult scramble in Kananaskis. 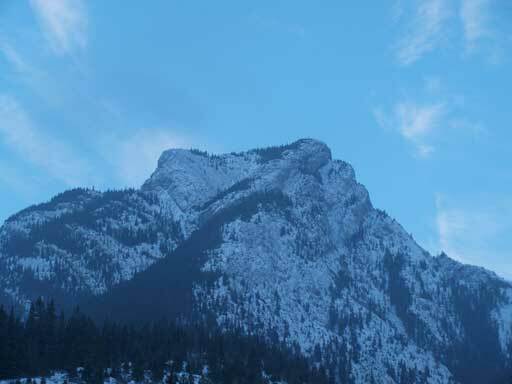 The two ‘towers’ are directly behind Heart Mountain Horseshoe and most folks don’t even know their unofficial name. 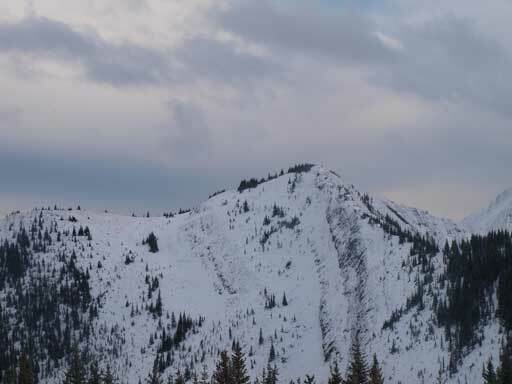 I also vaguely remembered seeing the name “Jewell Peak” referring to this peak due to its proximity to Jewell Pass but forgot the resource. And not to be confused with the 11,000er Twins Tower which has the “s” placed in a different word. 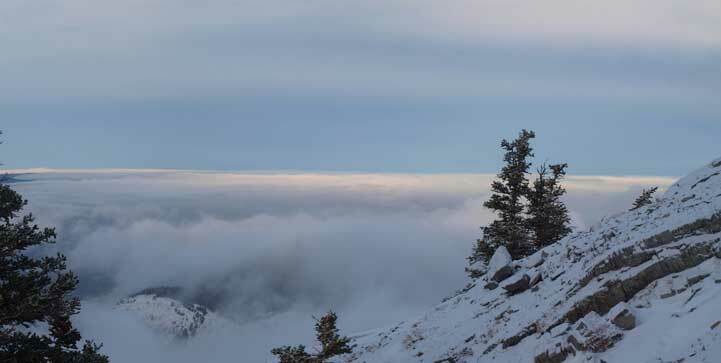 The standard scramble route for this peak is from Heart Mountain along the connecting ridge, but it’s not as easy as appeared on the map as there’s one difficult rock-band to negotiate. 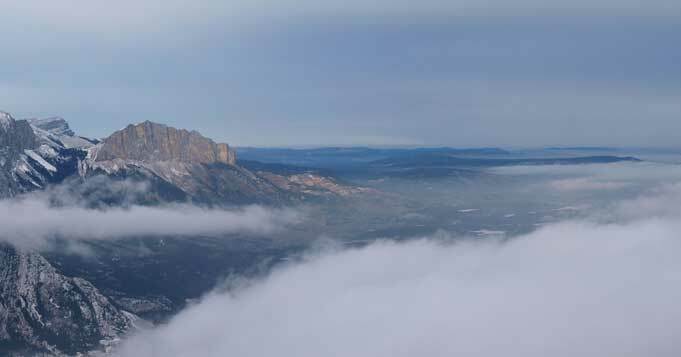 Compared to some of the harder Kane’s scrambles like Fisher Peak and Wapta Mountain, the crux on Twin Towers is shorter but I found the it’s more technically difficult. That being said, it’s more vertical, has less holds, and the holds are down-sloping. 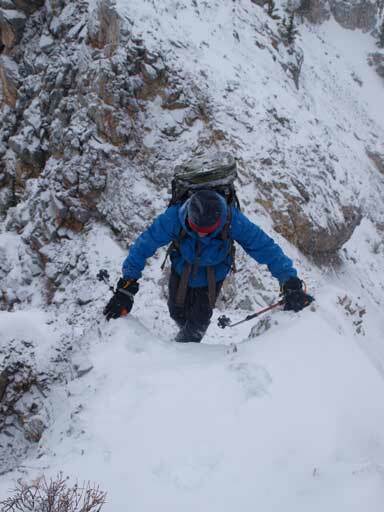 Under this condition, if all the holds are covered by a layer of new snow, than it becomes a climb. 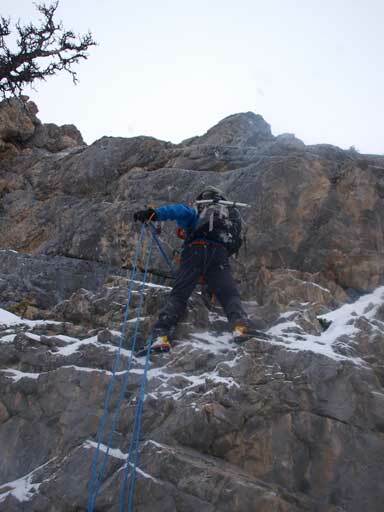 I fully knew this before even thinking about this peak so I brought up rope and some basic climbing gears. 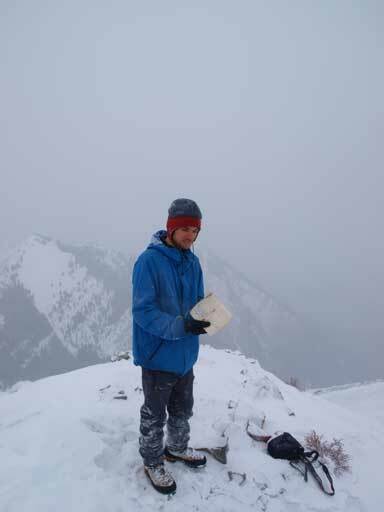 A quick water break at the summit of Grant MacEwan Peak, Ben and I started the traverse towards Twin Towers. 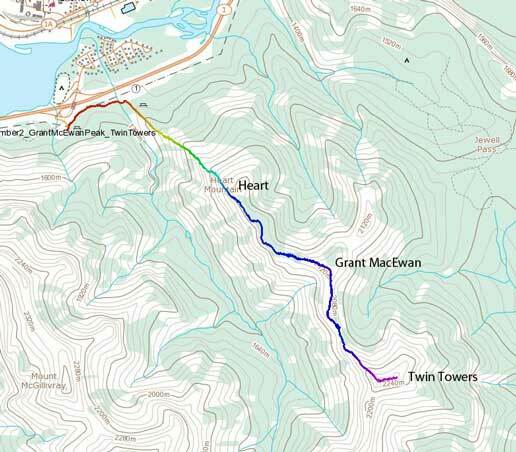 There’s about 100m elevation loss from Grant MacEwan Peak to the crux. Viewing from top, what we could see was drop-off. 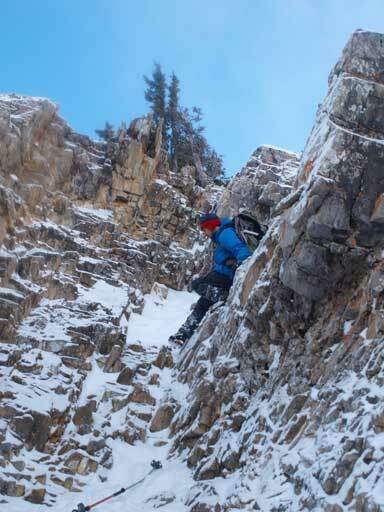 We had a few trip reports printed out and following their direction we descended initially skier’s left but then cut sharply to the right onto a ledge. 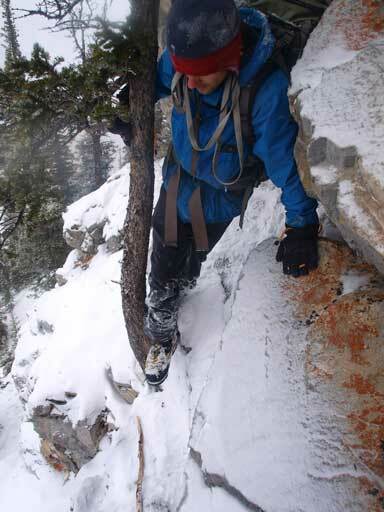 The ledge became narrower and narrower and with the new snow we had to use extreme caution, making sure we wouldn’t accidentally step on snow covered down-sloping and exposed slab.. Eventually the ledge became less than 1 foot wide. There’s a bigger tree nearby and I started to consider taking out the rope. At this part, the band is about 5-7m high, vertical. Probably due to the lack of confidence on rappelling, we decided to traverse further down the ledge for a short distance, aiming for the shortest down-climb. After some awkward moves we did manage to squeeze a bit further, and thankfully there’s a smaller tree for an anchor. The down-climb at this point was about 3m high, but again, vertical. The small tree was strong enough to give me a good hold and I tried to down-climb this part but I couldn’t. 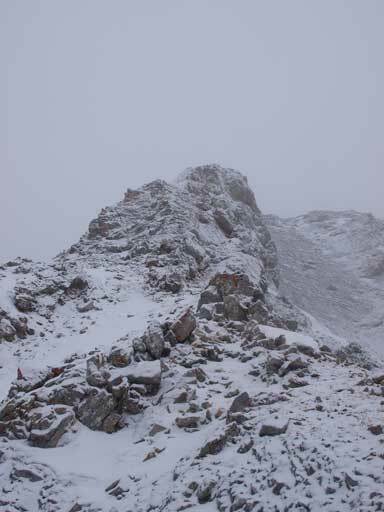 All the holds were slightly down-sloping and covered by the new snow. Obviously the tree was too small to be a good anchor, but at this point, I had no choice. 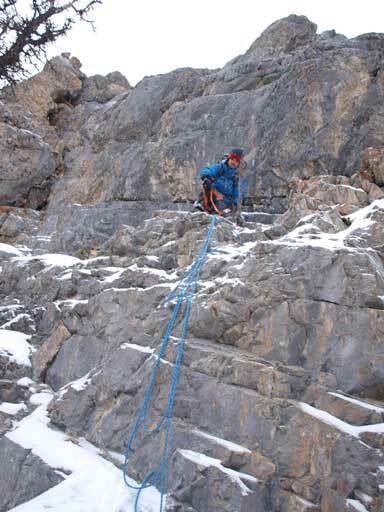 I rappelled down the step while Ben simply down-climbed using rope has a hand line (batman style). 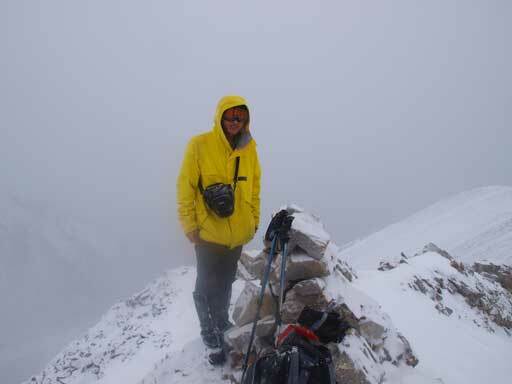 Under the reducing visibility and the light snow, we started the trudge up Twin Towers. Looking back at the crux, it doesn’t feel that hard though. 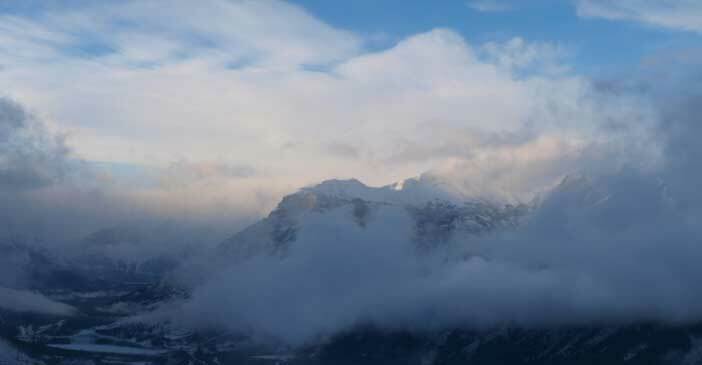 At this point there was already about 1cm of new snow from the day, and the entire ridge line got covered by this layer. The wind was almost zero so all the snow could stick to the slabs. 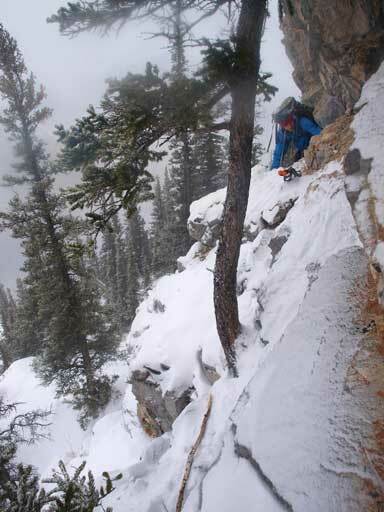 The ridge gets fairly exposed at places and needless to say, extremely slippery. 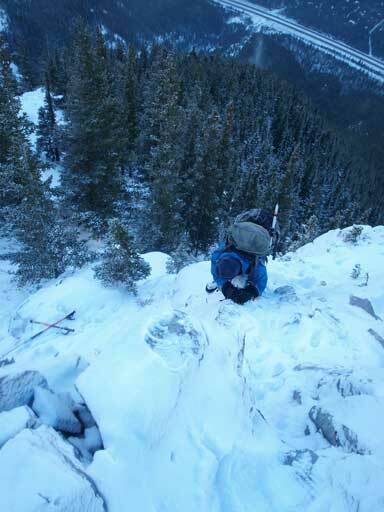 We carefully moved uphill, sticking to the ridge crest until about 50m short from the summit. 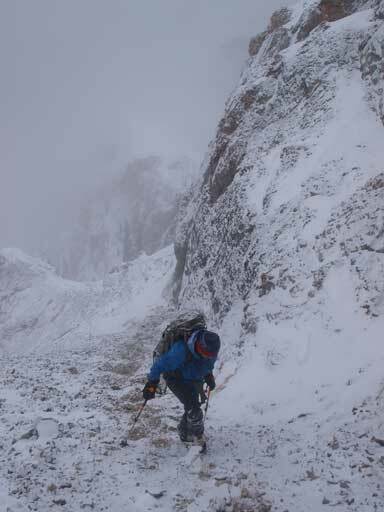 We descended the snow slope on our right hand side and then slogged up the tedious scree to the summit of West Tower. 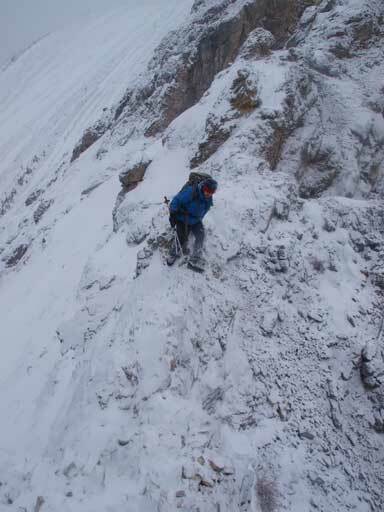 Under dry condition, you should probably want to stick on the ridge all the way up, and use the scree to descend. 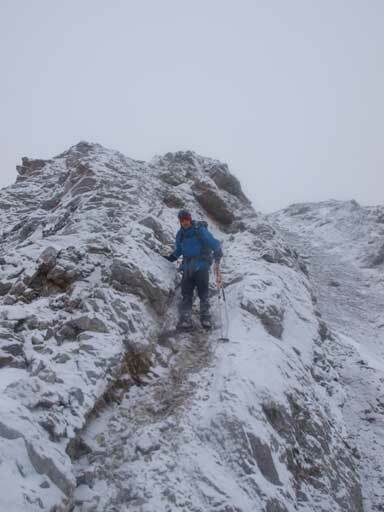 Typical condition on the upper mountain. But then the East Tower was the actual summit. 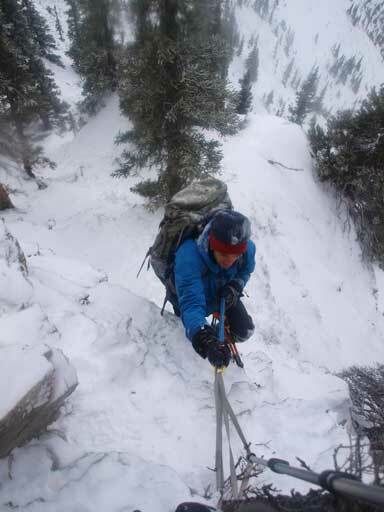 To get there, we had to descend snow on skier’s right side to the connecting saddle. Then it was merely a rubble slog up the east summit. There’s even a register on this rarely visited peak. 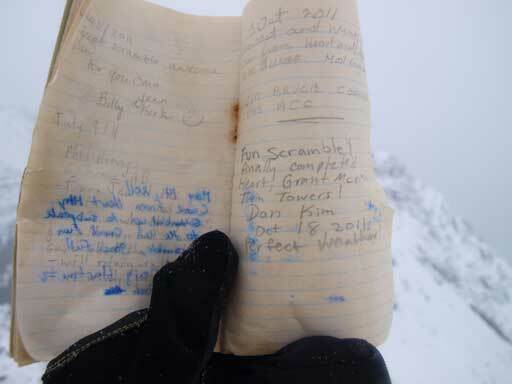 The last entry was in 2011… There was little hope for the weather to improve and we didn’t linger any longer on the summit. Slogging back up the west tower was very energy consuming due to the slippery nature of the terrain, and then we took the scree line down which was fast. 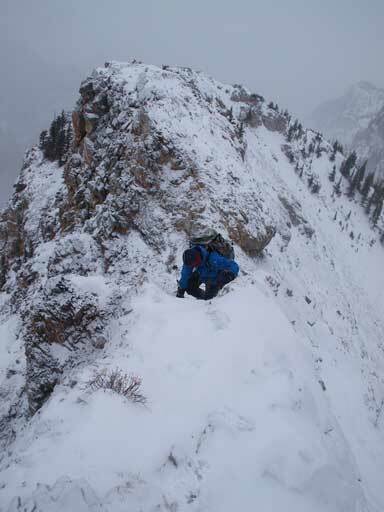 We carefully descended the snow covered ridge line and it didn’t take us long to arrive at the base of the crux wall. 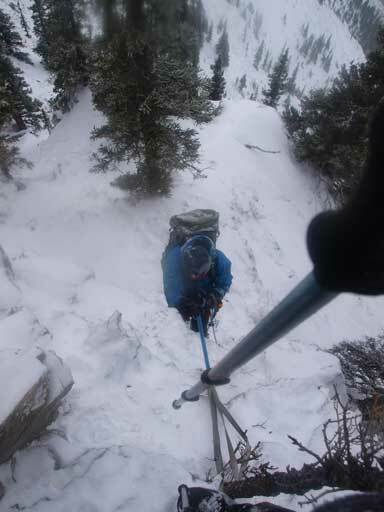 Both of us simply used the rope as a hand line to assist the up-climb and it worked pretty well. Sitting on the exposed ledge, I packed the rope inside backpack, and then the next 2min or so was definitely one of the difficult moments in this year. We both managed to squeeze over the extremely exposed and slippery ledge, and then one more slippery section, we made back through the crux section. If I do it again with the same condition, I will rap down from the first tree, and prussik up the rope on the way back. Descending the west tower. Typical condition and weather. Ready to traverse the hardest part. Down-sloping slabs with very little room and considerable exposure. 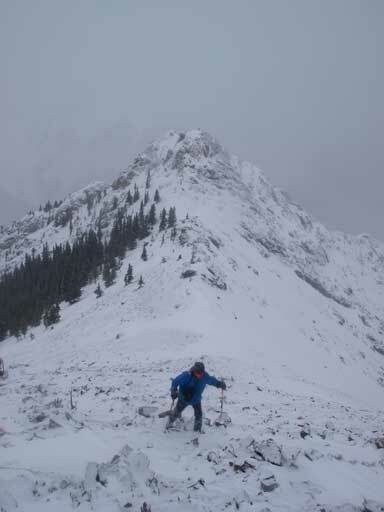 Slogging up Grant MacEwan Peak, I started to feel the elevation regain. I had to slow down quite a bit, and now I just realized I hadn’t eat anything except for half a muffin.. Well, let’s take a break on the summit of Grant MacEwan then. 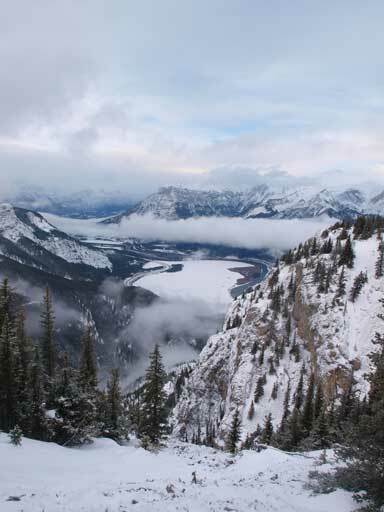 Looking up, we could see the weather starting to improve, and Mount Baldy and Barrier Lake started to show up. 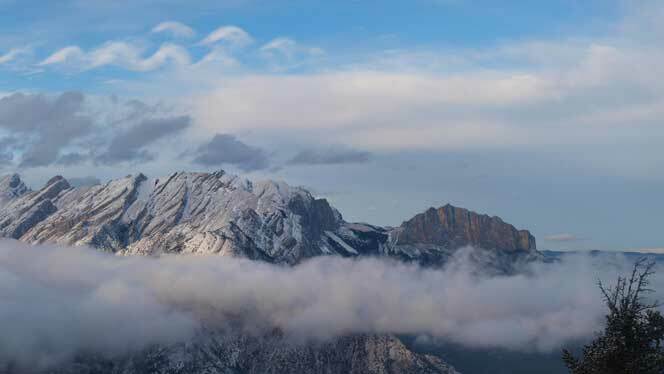 There was a piece of blue sky above Midnight Peak, and that’s motivating enough. We stayed on the summit for about 15min hoping the weather could get even better, and it did. 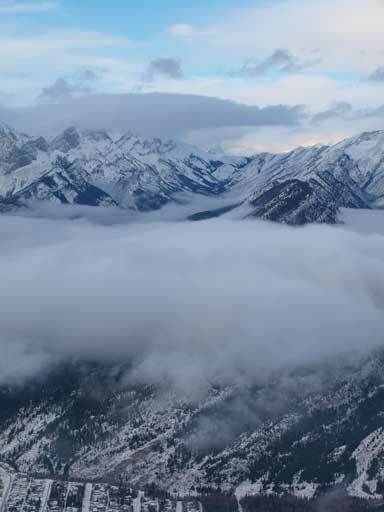 As we descending towards Heart Mountain, more and more pieces of blue colour showed up and the visibility was getting better and better. 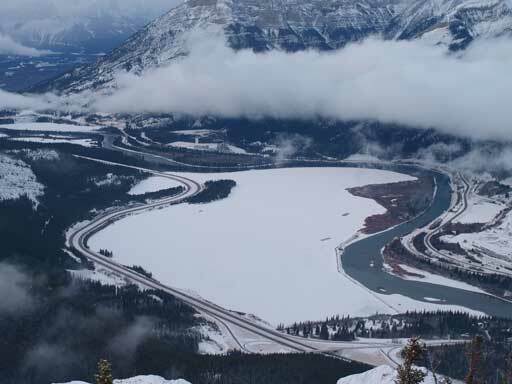 Topping back on Heart Mountain, wow, we could see the low clouds covering the prairie, and part of the Bow Valley corridor. 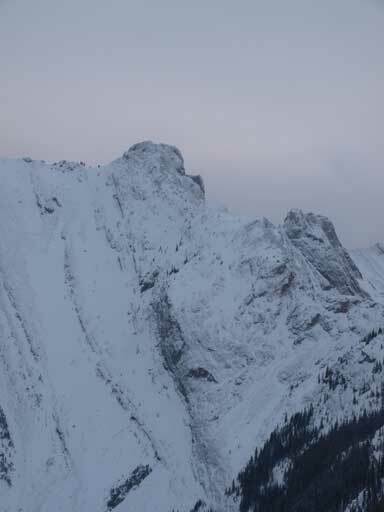 The sun was also low enough to provide some orange colour towards Grotto Mountain and Canmore corridor. Now with the new snow during the day, Heart Mountain was way different from what we’d just experienced in the morning. 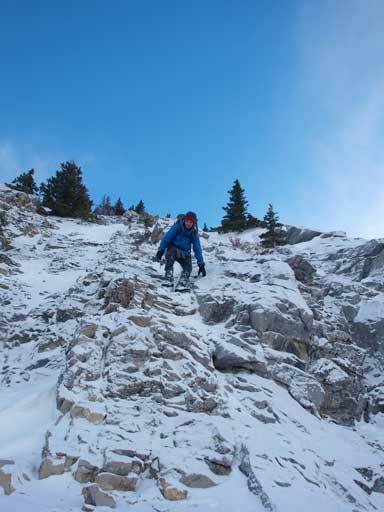 We had to hands-down regularly on some slabby sections, and the descent was much slower than anticipated. We also stopped regularly for photos. I must have taken more than 200 photos while descending Heart Mountain… The Heart Mountain crux also provided some challenge to us. Ben found a less steep (but more slabby) line further down, and he managed to down-climb it somehow. I tried several moves and decided to just jump down the crux. Further down the mountain, we constantly slipped and fell because we couldn’t see where’s slab and where’s dirt or scree. It’s kinda fun though..
Our round trip time was 8 hours 20 minutes and that concluded a fairly productive day given the not-so-great weather forecast. It’s also great to meet with Ben and little did I know at that point that Ben and I would climb more than 150 peaks together including half of the Rockies’ 11,000ers within the next few years!